"Class of 2016, let me be as clear as I can be: In politics and in life, ignorance is not a virtue," he told grads. If these political commentaries seem a bit one-sided, it may be because commencement speakers often skew to the left, and this year appears to be no exception. But these speeches are just the beginning. There are still many, many more to come this graduation season — including NPR Ed's Claudio Sanchez, who delivers the commencement speech for DePaul University College of Education in June. 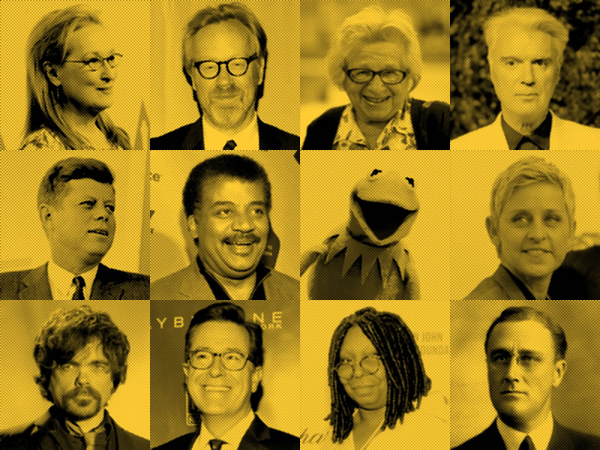 In the meantime, if you're looking for life advice — like "Do not pick your nose in public," from Sandra Bullock, or job advice — such as, "Try not to get a regular job," from Jay Leno — you should check out NPR Ed's online commencement database. We sifted through hundreds of grad speeches (dating back to 1774) and compiled our favorites. In the next few weeks, we'll be updating the database with the best speeches from the 2015 and 2016 seasons. If you see a great graduation speech this month or next month, let us know and we'll put it in. You can see a more comprehensive list from the blog Graduation Wisdom here. Tell us about your favorite graduation speeches — We're on Twitter at @npr_ed. Our Facebook page is here or you can drop us an email at NPREd@npr.org.